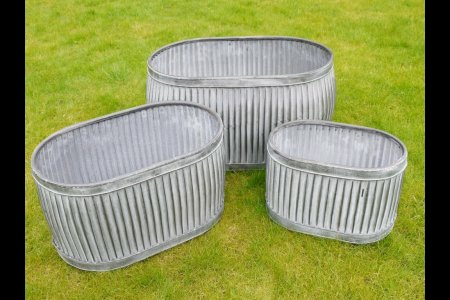 Galvanised Metal Planter Tubs Oval Now Online from arkvintage. Classic ribbed planters in galvanised metal. Fabulous vintage look for your garden shrubs, plants or herbs etc. Available online now in 3 sizes. You will need to add drainage holes if required for your choice of plant, very easily done! P&P is £5 plus £2 for each addition one of the same size on the same order.